Meerkat II is an adorable plush meerkat from the wonderful take-along sized Aurora World Mini Flopsies collection. With soft light brown fur, cream tummy and face, tan feet, and sweet brown eyes, this stuffed meerkat is sure to be a friend for life. Meerkat Fun Facts: Did you know that meerkats are so watchful and alert for birds that would prey on them (such as hawks and eagles) that sometimes even an airplane will send them scurrying for cover. 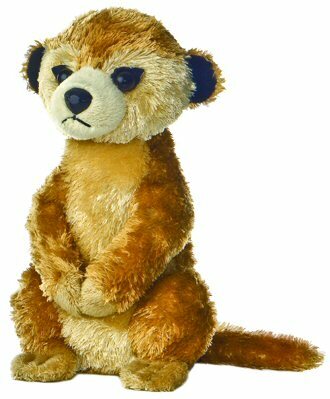 This huggable meerkat has soft light brown fur, tan and black accents, and warm brown eyes. This little Mini Flopsies stuffed armadillo is cute and cuddly with a plush gray body, creatively soft "armored" shell, and sweet face. Bubbles plush bunny has soft tan and white fur, fun felt teeth, and holds tight to its puffy orange carrot. This sweet Lil Buddies plush armadillo is cute and cuddly with soft and nappy rust fur and cream accents. This plush badger has a huggable body of nappy, white-tipped, dark gray fur and soft black and white fur. This adorable plush bison has soft brown fur, shaggy light brown shoulders, and fun black horns.